The Boardinghouse episode is now available. You can get it through iTunes or download it from HERE (right-click & 'save as'). Enjoy! Jim is an unusual boss and his hobbies make performance reviews a little uncomfortable. Lita Ford called...she wants her...everything back. Next up is a little Italian cheese from the wave of Raiders of the Lost Ark rip-offs. 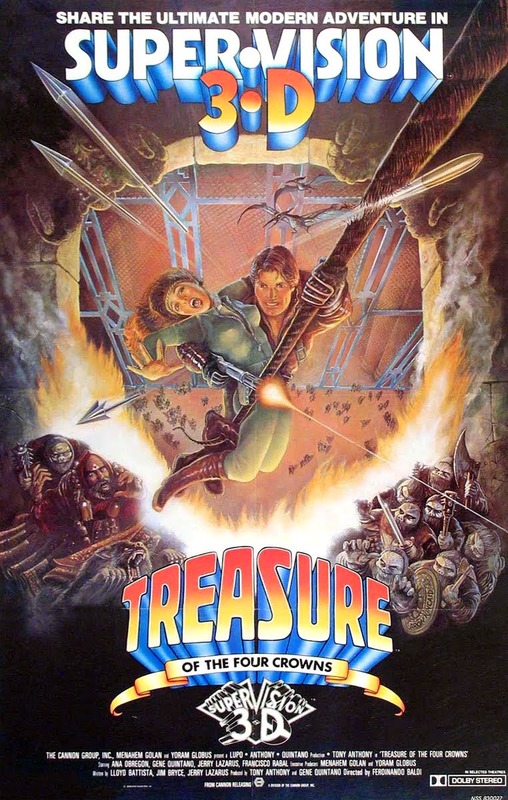 This film was also made during the 3-D movie boom of the early '80s. We're watching it in 3-D and you can, too! What, you don't have RED/CYAN glasses? This manufacturer will send a free pair for the cost of a SASE (self-addressed stamped envelope) and a stamped envelope to send it in. FREE 3-D GLASSES! Errata: I mistakenly referred to the female lead's screen name as Kalassu Sue, but it was Kalassu Kay. Apologies.